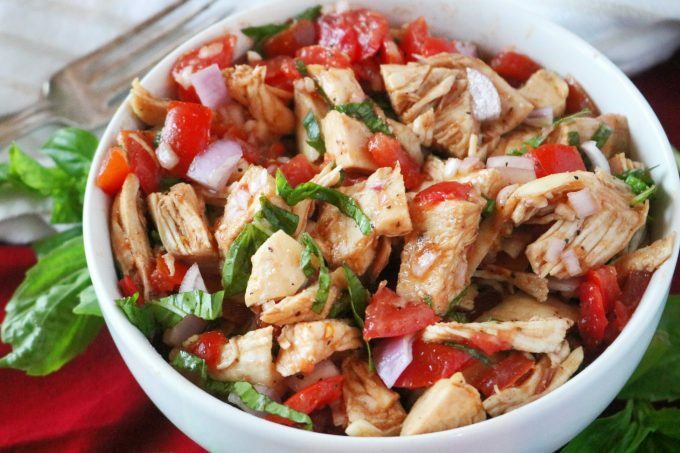 Turn boneless, skinless chicken breasts into an exciting Italian chicken salad, with easy tomato bruschetta and a quick balsamic dressing. This recipe is one of my summertime favorites, and I pull it out every year when the tomatoes are at peak season. But, to be perfectly honest, it was created out of sheer desperation. We’ll get to that one later. Last summer, my husband built us a trio of fairly large, beautiful, stone garden beds in our backyard. He inherited what I consider to be a supernatural green thumb from his mother’s side of the family. He’s told me sweet stories of planting and harvesting produce alongside his grandfather, and all about the little roadside produce shop they set up together in old Bryan when he was just a little boy. A hearty garden of his own had been a lifetime goal, and once this goal was achieved, to say he was a little overzealous when it came to planting would be a massive understatement. He planted all kinds of summer crops: From eggplant to yellow squash, okra to peppers, we had it all. But, by far what we had the most of, was tomato plants. So many tomato plants. I’ll admit, it was the crop we were most excited to have homegrown at our fingertips. However, turns out 30 plus tomato plants is far too many for any one household to consume. Don’t get me wrong, I tried. I made salsas, and scratch-made marinara. 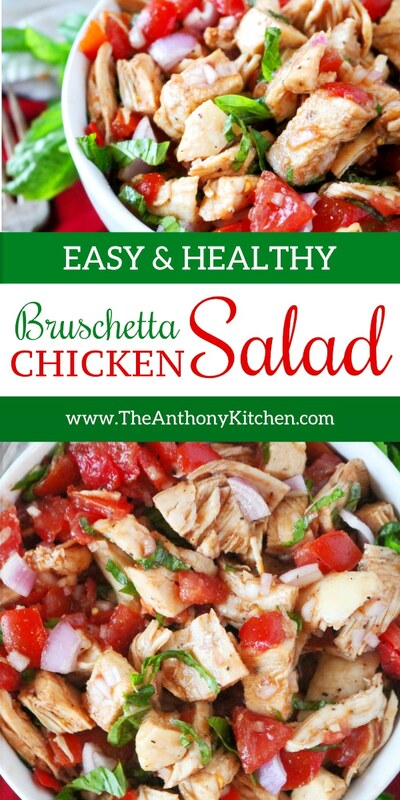 It was Caprese salads for a solid month, and my recipe for fried green tomatoes was perfected; but, quite possibly my favorite innovation from the summer the tomatoes took over was this Bruschetta Chicken Salad. It’s absolutely perfect for entertaining, as it is a stellar make-ahead dish…if you have the willpower to resist eating it right away. 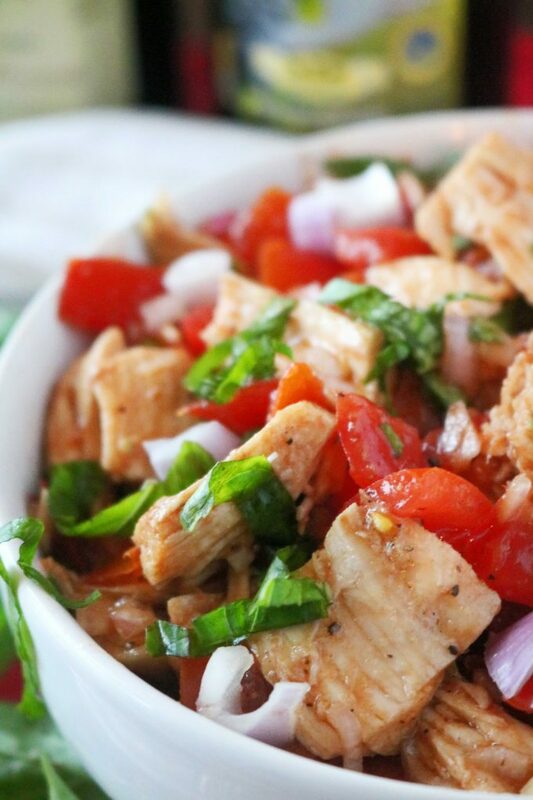 The tomato bruschetta and the chicken have a chance to sit in the fridge overnight, they soak up the balsamic dressing making for a juicy and succulent masterpiece of flavors. 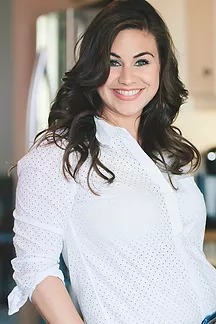 However, keep in mind that tomatoes have an extremely high water content, so if it appears a to be a bit juicier come the next day, that’s perfectly ok and extremely delicious. 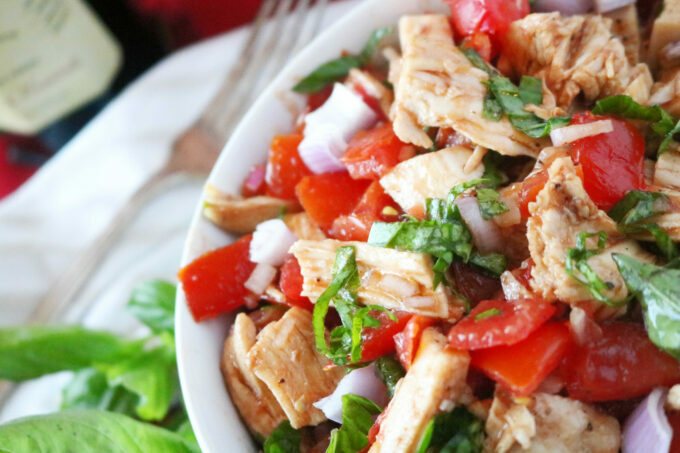 I use this bruschetta chicken salad for entertaining, but I also use it as a make-ahead, healthy lunch, as a dinnertime stuffing for Bruschetta Chicken Sandwiches and as a topper for Bruschetta Chicken over Romaine. Whichever way you chose to enjoy it, I can personally guarantee, you’ll likely choose to enjoy it again and again. This one’s a keeper. 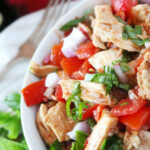 An Italian chicken salad, with easy tomato bruschetta and a quick balsamic dressing. 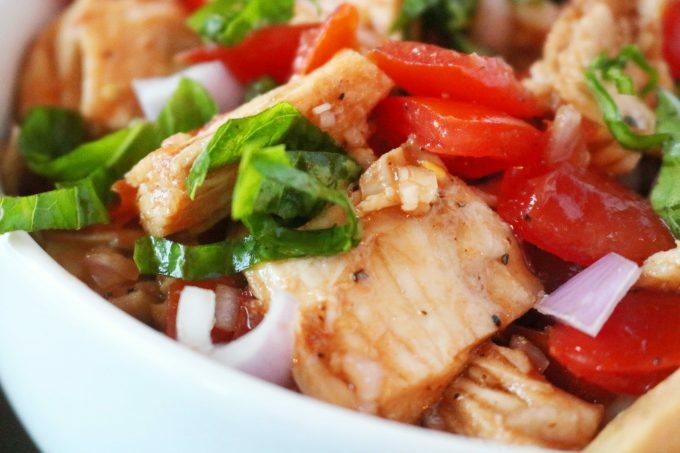 In a medium-sized mixing bowl, add balsamic vinegar, salt, and pepper and stir to combine. Drizzle in olive oil and whisk thoroughly until emulsified. Add remaining ingredients and toss to combine. Serve and enjoy.